South America Sheet III South Brazil with Paraguay and Uruguay. This is a fine example of the 1837 Society for the Diffusion of Useful Knowledge or S.D.U.K. map of Uruguay, Paraguay and Southern Brazil. It covers from San Salvador south as far as Buenos Aires. 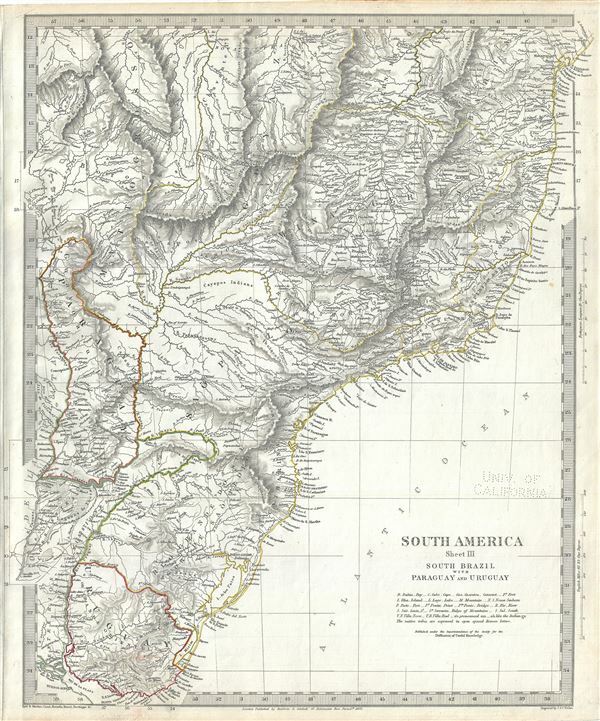 The map also notes part of the Rio Grande Do Sul region in Brazil. These territories were known as the Banda Oriental or Cisplatina region before the 500-day Cisplatine War. Throughout, the map identifies various cities, towns, rivers, mountain passes and an assortment of additional topographical details. The 1828 Treaty of Montevideo following the Cisplatine War gave birth to Uruguay as an independent state. This map was issued shortly after the Brazilian war of Independence that freed the massive South America nation from colonial Portuguese control in 1822. In 1831, Pedro I, the founder and first ruler of the new Empire of Brazil abdicated in favor of his five year old son and left for Europe. Under the weak regency elected to rule the country until Pedro II came of age as Emperor, Brazil descended into in civil war. In 1840, Pedro II was declared fit to rule and, proving a strong monarch, managed to bring stability and peace to Brazil. Rumsey 0890.150. Phillips (Atlases) 794.